In response to disasters such as Hurricane Maria and the political discourse about climate change, the West Coast has become the epicenter of innovation and use of new energy systems. Lilo Danielle Pozzo, who teaches chemical engineering at the University of Washington, grew up in Puerto Rico. So when Hurricane Maria devastated the island in September, it felt, she said, like a perfect alignment of needs and expertise: Pozzo studies batteries and electrical storage systems at the university’s Clean Energy Institute, and Puerto Rico, a place she loves, had just seen its power grid destroyed. She led a team from the institute to a remote mountain community called Jayuya that was still completely without power two months after the disaster. “We want to see what we can contribute,” she said. After interviewing residents about one of their most dire problems — the health implications of power failure for medications and home medical devices — the team installed solar-powered refrigerators in a community center on Thanksgiving. They had been bought with contributions collected in Seattle, and Pozzo returned there to plan next steps with a universitywide committee she had helped put together. The impulse to help Puerto Rico — an often neglected corner of the nation that has struggled after the storm — rebuild has rippled through many corners of America. But in the world of electricity research, which has staked out a place of geeky global dominance on the West Coast, an equally powerful idea about the island has resonated: It is a chance to work on a blank canvas. Researchers’ heads have danced with visions of self-sufficient microgrids and solar-harnessed battery systems as they dream of giving Puerto Rico a new power system that is cleaner and less carbon-intensive than the fossil-fuel-dependent one the storm wrecked. The island is becoming an important proving ground for ideas about how low-carbon energy can be practical, both technically and financially. Companies are also jumping in. Tesla, the electric vehicle and energy company based in Palo Alto, California, created and installed a project using solar generation and battery electricity storage for a children’s hospital in San Juan in October, and recently announced plans for six more battery projects on two Puerto Rican islands. Arensis Corp., a Los Angeles-based company specializing in off-the-grid electricity, installed a generating system at a refugee support center in Fajardo, aiming to use building waste from the disaster itself as fuel. The University of Washington is building what it calls an innovation district west of its central campus with the goal of becoming the regional hub for energy research. Researchers hope it can connect with the global health and climate work at the Bill & Melinda Gates Foundation. There is also impetus on the political side. Gov. Jay Inslee, a Democrat, is expected to aggressively push for climate legislation in the next session now that his party controls the state Senate. A climate hawk since his days in Congress, Inslee joined with the governors of California and New York, Jerry Brown and Andrew Cuomo, to found the U.S. Climate Alliance, an organization of states committed to carbon reduction. “Our state is doubling down,” said Daniel T. Schwartz, the director of the Clean Energy Institute. The ferment for low-carbon energy, felt up and down the coast, reaches beyond power grids. Transportation systems are also rapidly electrifying in ways that researchers said could play a role in Puerto Rico and in the aftermath of future disasters, when fuel supply and distribution often become a major headache. 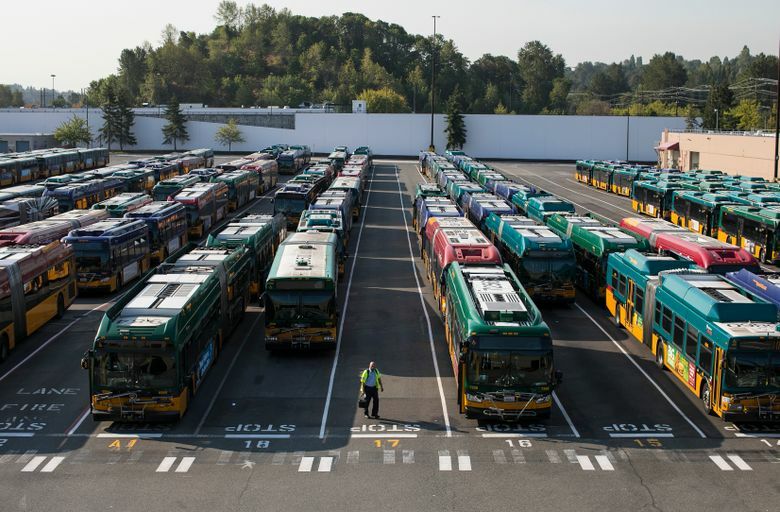 As battery technology has improved, King County Metro, the nation’s fifth-largest bus and trolley system by passenger-miles, has been a leader in electrifying its vehicle fleet. So has Los Angeles, the nation’s second-largest system. And two of the world’s biggest electric bus manufacturers have consolidated operations or research work on the West Coast, to be nearer their markets and the technical talent they need to recruit. “Right now, it’s a race between California and Washington state, as to which state will, at the regional level, essentially declare an end to the era of fossil fuels,” said Ryan Popple, the chief executive of Proterra, an electric bus builder based south of San Francisco. The company landed a $60 million contract this year to supply vehicles to King County. Money and strategy also play a role in the surge on the West Coast. Revenue from California’s carbon emissions cap-and-trade law, which has yielded about $4.4 billion for the state during the past five years, is being used to help local communities invest in electric transit. Washington state has set up a system for local transit agencies to buy zero-emission vehicles at lower cost and with less paperwork. Because of the huge hydroelectric dams of the Columbia River system, the Pacific Northwest’s power supply has long been among the cheapest and cleanest in the nation. That has shaped the region’s power grid and the ideas that bubble up here about what a grid should be. Matthew D. Murbach, a graduate student at the University of Washington, came up with a way of testing and repurposing used bus batteries, an idea he said makes economic sense in a place like Seattle, which uses many hybrid electric-diesel buses. Working with his professors at the Clean Energy Institute, he helped to start a company to commercialize the idea even before finishing his Ph.D. The first big test of his method started this month on an island off the coast of British Columbia, an hour north of Seattle by floatplane. A small internet provider there is using decommissioned Seattle transit batteries, harnessed together with solar panels and a generator, to power a wireless network for 700 off-the-grid customers. If the project is a success, it could have potential for many other remote communities. Electricity experts said the work in Puerto Rico promises to be useful in helping other regions prepare their power systems for major disasters like hurricanes, blizzards or earthquakes, and to emerge from them both more resilient and more climate-friendly. Pozzo and other experts say their optimism has to be tempered by the reality that the large amounts of public or private money needed to thoroughly rebuild disaster-ravaged electrical systems simply may not materialize. Without it, people in places like Puerto Rico may be left to patch together whatever ad hoc power supply they can — and rather than move to a cleaner future, they may have to depend even more heavily on small, inefficient oil-burning generators.